The panel at the Martin Luther King Jr. Educational Day program, from left to right, included Jeff Mallory, Emily Frost, Debra Mason and Jeff Bennett. 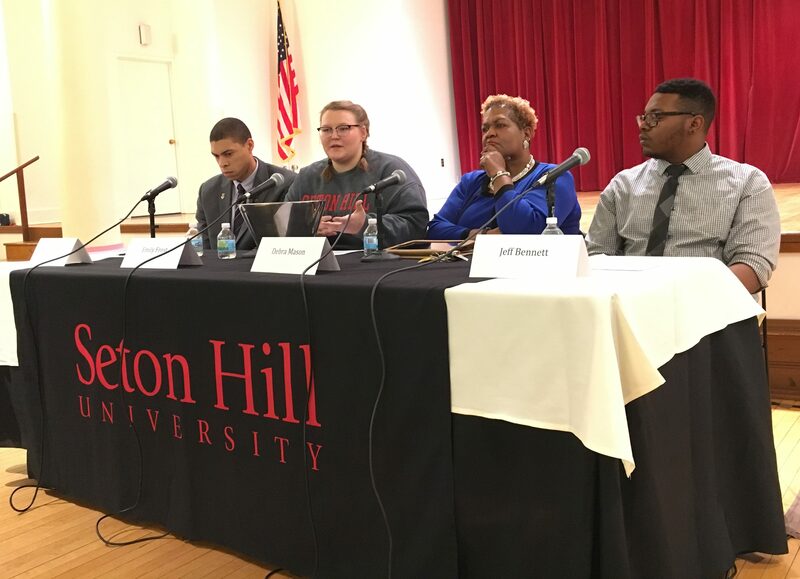 Frost and Bennett are students at Seton Hill University (SHU), while Mallory is the director of multicultural affairs at Duquesne University and Mason is the diversity officer at SHU. Photo by A.Shriane/Setonian. On Feb. 2, students and faculty flowed into Cecilian Hall for the Martin Luther King Jr. Educational Day program. To begin the event, a group of students walked down the aisles and performed an act discussing the change they want to see in the world. As the group of students disappeared, Michael Jackson and his hit “Man in the Mirror” started to play, and the Seton Hill University (SHU) Dance Program performed, creating an art of changing ourselves to make a difference. The program continued with SHU President Mary Finger discussing different facts, including the Selma to Montgomery March and unequal higher education for minorities. Keisha Jimmerson, the director of multicultural and international services at SHU, coordinated the program and explained how the event would flow. A series of questions about social injustice were asked and the panel board of adults answered to the best of their ability and gave specific experiences. The panel included Jeff Mallory, Emily Frost, Debra Mason and Jeff Bennett. Mallory came from Duquesne University, where he works as the director of multicultural affairs. Frost is a senior at SHU majoring in art therapy. Mason is the diversity officer here at SHU, and Bennett is also a senior at SHU majoring in criminal justice. To start the discussion, the first question was “When were you silent about things that mattered?” This question related directly to the theme of the program based on a famous King quote: “Our lives begin to end the day we become silent about things that matter.” Bennett started the discussion by describing his situation where he felt his opinion was meaningless. He didn’t predict things were going to change, whether he stood up for something that mattered or not. Members of the Seton Hill Dance Program perform Michael Jackson’s “Man in the Mirror” at the beginning of the program. Photo by A.Shriane/Setonian. Mason ended this topic by informing students that she has always been the type of person to stand up for things; however, she learned that she must pick and choose her battles. Mason went on to explain that we must stick together; our battle should be everyone’s battle. She related that to the Women’s March that recently happened nationwide. Men were marching for women’s rights, which she said is a very powerful situation both emotionally and politically. Mallory provided students with how to go through the process of standing up for something that matters. First, he said we must define our actual values and ethics we have. From there we decide how to confront the issue. We have empathy, we put ourselves in the other person’s shoes and work together through the issues to change and grow together.